I thought I was meant to go on a segueway tryout today, but it seems it’s next week, so the alternative two wheel adventure will have to wait. Our village, East Linton, is a conservation one, conserved up to the eyeballs. We still have an old working water mill, from the 18th century, a doocot from the 15th, Prestonkirk with bits from the 11th century and lots of old houses, etc. It’s all far too much to go into. In the picture the bunting is up as it is Gala week, a Queen is crowned with her assembled court and there is a parade through the village, highland dancing and a run across the river and up to Traprain Law, the local hill, and back. I run the website for the Community Council and have posted some photos of the event – www.eastlinton.uk.com. The fountain in the photo is in The Square (which is more like a triangle now). It was gifted from John Drysdale in Buenos Aires, Argentina in 1882. He was a former native of East Linton but obviously did well when he migrated to become a farmer, rancher & businessman. From some angles the cherubs with their water urns look slightly dodgy a le Mannekin Pis in Brussels. But what has all this to do with Jessie? Look at the former church of St Andrews in the background. This was built in 1843 as a free church, probably the first one after the ‘Great Disruption’ when a third of the congregations in Scotland broke away from the Church of Scotland and walked out of their churches. Before then the ministers were appointed by the landowners but the Free Church members wished to appoint their own. If you’re eagle eyed and the photo is not too small you’ll notice I took this today just after mid day. Why might you notice? There is a clock face on the tower and it is showing one or two minutes after twelve. The clock belongs to the village and was put in for Queen Victoria’s Jubilee – it is chiming right now as I write. Some time after it was installed some local laddies climbed up into the tower and poured a libation (beer, wine, whisky, who knows?) over the clock and christened it Jessie after a local lass Jessie Cowe. She eventually married and went off to Argentina, but the name stuck. So if you ever visit and hear the locals saying “aye, Jessie’s a wee bit fast today” or “Jessie’s not been the same since she was electrified” or “I think they should sort Jessie oot” I think you may have an inkling of what the conversation is really about. 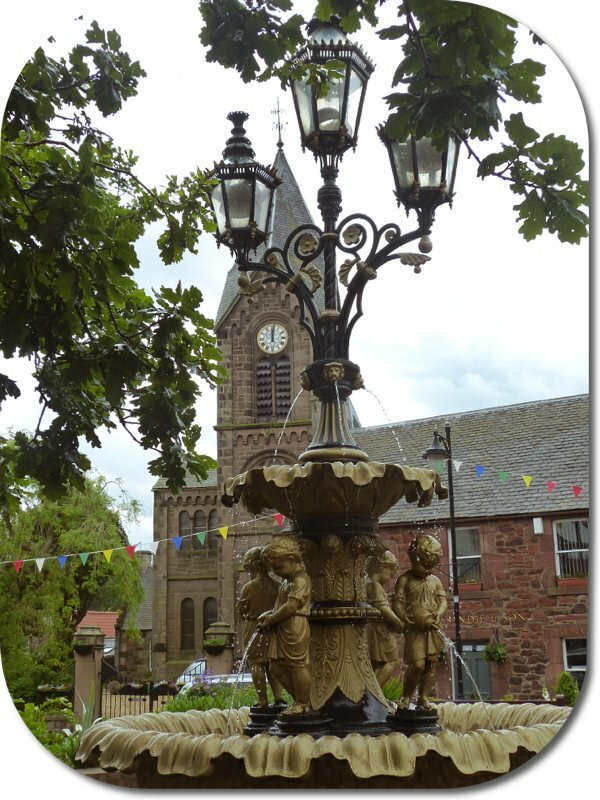 This entry was posted in clock, East Linton, Fossil cyclist, fountain, history and tagged Argentina, church, clock, East Linton, fossil cyclist, fountain, history, Jessie, Queen Victoria, Scotland on June 15, 2015 by fossilcyclist.